New WBG President David Malpass speaks at an event on The Power of Partnerships: Mobilizing Finance and Unlocking Private Sector Solutions at the 2019 Spring Meetings. Credit: World Bank. The 2019 World Bank and IMF Spring Meetings began with the announcement of a projected decline in global economic growth, with the IMF’s World Economic Outlook, April 2019 report noting that “global growth [is] now projected to slow from 3.6 percent in 2018 to 3.3 percent in 2019, before returning to 3.6 percent in 2020.” The relative optimism for 2020 comes with significant caveats, with emerging economies already experiencing low levels of growth and with the IMF finding 40 per cent of low-income countries to be in, or at high risk of, debt distress. Considering this context, the IMF’s Independent Evaluation Office evaluation’s report on financial surveillance of January 2019 – which noted that current lack of expertise in Article IV teams and of resources in the Financial Sector Assessment teams coupled with the financial surveillance programme’s focus on relatively stable countries – must have given the Fund pause. Concerns about a deepening of the trade war between China and the US and the unravelling of the ‘rules-based’ multilateral system were again a topic of intense discussion, with the International Trade Union Confederation calling for “an equitable multilateralism that supports a new social contract and sustainable development” ahead of the meetings. Meanwhile, UN Conference on Trade and Development (UNCTAD) and Boston University’s Global Development Policy Center released a report entitled A New Multilateralism for Shared Prosperity: Geneva Principles for a Green New Deal, which provides a five-point plan to address fundamental problems with the current global system. 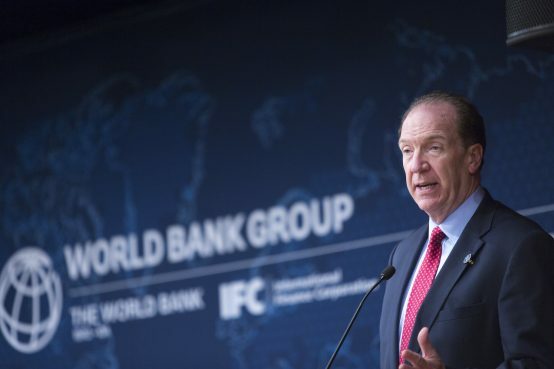 As the Bank and Fund met in Washington to ponder the challenges posed by the crisis of multilateralism brought about by marginalisation and lack of trust in their institutions, it was with a palpable sense of embarrassment that the World Bank presented its new president and renowned skeptic of multilateralism, David Malpass, to the world. While the Bank’s Executive Directors (EDs) tried to put on a brave face and convince those gathered in Washington (and themselves?) that they had lived up to their promise to ensure a transparent, open and merit-based process (see Observer Spring 2019), presenting the appointment of yet another US national in a one-man contest as a paragon of 21st governance proved a challenge beyond even the Bank’s well-oiled PR machine. This was quite clear at the civil society round table with World Bank Executive Directors on 9 April where Christian Aid’s CEO Amanda Mukwashi’s made an impassioned demand that the illegitimate process must come to an end. She argued that the process reflects and perpetuates the global power imbalances that create the conditions that undermine the Bank’s very efforts to meet its twin goals of eradicating poverty and reducing inequality – wait, no, apologies, increasing ‘shared prosperity.’ The dynamics at the round table also seemed to speak volumes about the failings of the Bank’s efforts meet the goals outlined in the Spring 2018 Report to Governors on Shareholding, to “enhance the voice and participation of developing and transition countries,” as EDs from the Global North dominated the discussion, as usual. The dynamics between China and the US on the issue bares close attention. For now, there seems little reason for hope of a significant and equitable re-organisation of the current multilateral system, as once again demanded by major developing countries of the G24, which in its communiqué stressed that “the lack of progress on the IMF 15th General Review of Quotas is a major source of concern since quota increases are essential to undertake the necessary quota realignment.” The lack of progress in Bank and Fund governance reforms leaves many wondering whether China and others will begin to increasingly distance themselves from them and rely more on fragmented regional systems (see Observer Spring 2016). The extent to which the IMF has followed its own advice on promoting inclusive growth has been called into question by research from Brussels-based civil society organization (CSO) Eurodad on conditions in IMF loans for 26 country programmes approved in 2016 and 2017. Eurodad found that at least 20 of those countries had experienced strikes or protests against “government cutbacks, the rising cost of living, tax restructuring and wage bill reforms pushed by IMF conditionality.” It will be interesting to see whether the forthcoming IMF conditionality review will address the issue. As the prime minister of Barbados highlighted in her remarks at a joint event hosted by UNCTAD and Boston University’s Global Development Policy Center on 12 April, the focus on corruption in the developing world and the silence on the role played by the developed world in enabling it (and indeed silence on corruption in rich countries), remains a striking and unacceptable double standard. The disparity of the treatment of countries in tax haven blacklists is a clear case in point. According to a 2017 Oxfam report, four EU countries classify as tax havens by EU criteria, but are excluded from the blacklist. A December 2017 Blomberg article noted that the US, “is becoming the world’s new tax haven.” Despite forcing hundreds of countries to comply with rules it devised, it does not follow them. In short, there is much talk of debt, taxes and governance ‘failures’ in the developing world without mention of the role played by the developed world in the process, plus ça change. Given that, as noted in an April blog by the International Institute for Sustainable Development, “approximately 70% of greenhouse gas (GHG) emissions are linked to the construction and operation of infrastructure,” the fact that climate change was barely mentioned in the IMF’s Fiscal Forum event on infrastructure finance spoke volumes. Those following the sustainable and ‘quality’ infrastructure debate were also concerned by how far the World Bank lags behind other Multilateral Development Banks, such as the Inter-American Development Bank, in integrating social and ecological sustainability within its infrastructure finance framework – which remains largely focused on its much-criticised leveraging private sector investment agenda. The disjuncture between rhetoric in Washington and country programming brings further doubts about the Bank’s ability to contribute to closing the ‘other infrastructure gap’ identified by the UN Office of the United Nations High Commissioner on Human Rights (OHCHR) last fall: sustainability and rights. Fragility, conflict and violence were once again front and centre of discussions, with the Bank announcing the launch of its forthcoming Fragility, Conflict, and Violence (FCV) Strategy Consultations between April and September 2019. The Bank continues to present FCV situations as the final frontier of the battle against poverty. While much was made of the International Development Association (IDA), the World Bank’s low-income lending arm, doubling of its support to FCV settings, civil society and borrowing countries expressed concerns about the effectiveness of the Bank’s approach in these settings. The challenges were made clear by the Bank CEO Kristalina Georgieva’s unwillingness to engage with the comment by former Chilean President and UN High Commissioner for Human Rights, Michelle Bachelet, during a ‘flagship’ event on 10 April, that a human rights-based approach is essential to address fragility and violence. The Bank CEO similarly failed to explain how the Bank will adapt its approach to bring it in line with the insights of Nobel Peace laureate Ellen Johnson Sirleaf that effective action requires adaptability and local-level engagement. Given that state legitimacy and service delivery were identified as keys to successfully address drivers of conflict and fragility, observers will be watching closely to see whether the Bank will change its policy prescriptions, such as privatisation, reduction in public sector wage bills and erosion of workers rights, that, as noted in UNCTAD and Boston University’s above mentioned Geneva Principles report, have undermined the social contract. The Bank and Fund’s silence on the utility of the recently released Guiding Principles on Human Rights Impact Assessments provides further evidence of both institutions’ unwillingness to reconceptualise their work through a human rights lens and therefore better address many pressing concerns (see Observer Spring 2019). As IDA delegates met at the Spring Meetings to begin negotiations on the replenishment of IDA 19 in the wake of the IDA 18 mid-term review, CSOs continued to be excluded from the discussions among delegates. Currently CSO contributions are limited to participation in the IDA Forum, which, due to time constraints, is not a particularly effective space for substantive exchanges. As with all aspects of the Bank and Fund’s work, the IDA 19 replenishment is framed by China-US tensions, with US Treasury Secretary Mnuchin calling, in a veiled reference to alleged Chinese ‘debt diplomacy’, for better and more transparent debt management by borrowers. The use of IDA’s private sector window (PSW) came under criticism from senior US officials for lack of transparency and evidence of its contribution to sustainable development, as outlined in a Center for Global Development blog. In fact, well beyond discussions about the PSW, doubts about the Bank’s Billions to Trillions agenda, implemented through its Maximising Finance for Development (MFD) initiative, were raised in a report by UK-based Overseas Development Institute that stressed that “each $1 of MDB and DFI [development finance institutions] invested mobilises on average $0.75 of private finance for developing countries, but this falls to $0.37 for LICs [low-income countries].” This approach and its promotion of public-private partnerships (PPPs), particularly in education, was further challenged by a new Oxfam report on education PPPs in Punjab and the adoption of the Abidjan Principles on the human rights obligations of States to provide public education and to regulate private involvement in education. As the World Bank and IMF approach their 75th anniversary this summer, communities, social movements and others disadvantaged by their policies and programmes hope that both institutions finally critically engage with ever-mounting evidence of the failures of their policies, and undertake radical policy shifts that go beyond slow and uneven progress on the key development challenges of the day.